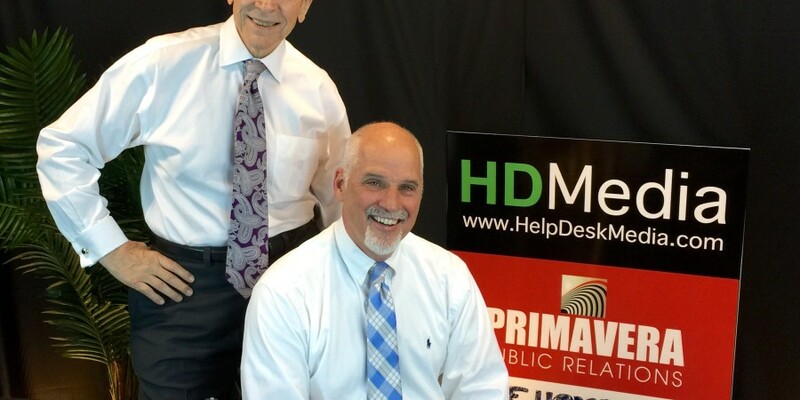 YORKTOWN HEIGHTS, NY (June 29, 2015) – In announcing the opening of a full service video production studio here called HD Media/Primavera Productions, co-founder Donald Kelly says, “As the demand for web content increases, so does the need for quality video production, and I am delighted to partner with Bill Primavera of Primavera Public Relations to service businesses and individuals in the Hudson Valley region. The HD Media/Primavera Studio is located in Yorktown Heights at 2718 Hickory Street at the corner of Granite Springs Road in the historic Ebenezer White House. The studio features seven cameras, nine audio recording tools, 15 pieces of studio lighting, three settings, three backdrops, including green screen, and a variety of formats from which clients can choose, including voiceovers, video profiles, “elevator pitches,” and professional editing. Prior to his entry into video production, Kelly enjoyed a successful career as a mortgage banker for over 30 years, and therefore speaks the language of the real estate industry thoroughly, one area of concentration for the new enterprise. In that regard, he is a good match to Primavera whose resume includes being a realtor with William Raveis Real Estate and is known as “The Home Guru,” a branded weekly columnist for The Examiner and a blogger on the subject of home improvement and lifestyles. Don Kelly also is involved with producing video of the Honor Flight of the Hudson Valley which flies veterans of World War II to Washington, D.C. four times a year for a whirlwind tour of the monuments and memorials there.